Podcasting and other forms of on-demand digital audio are growing. 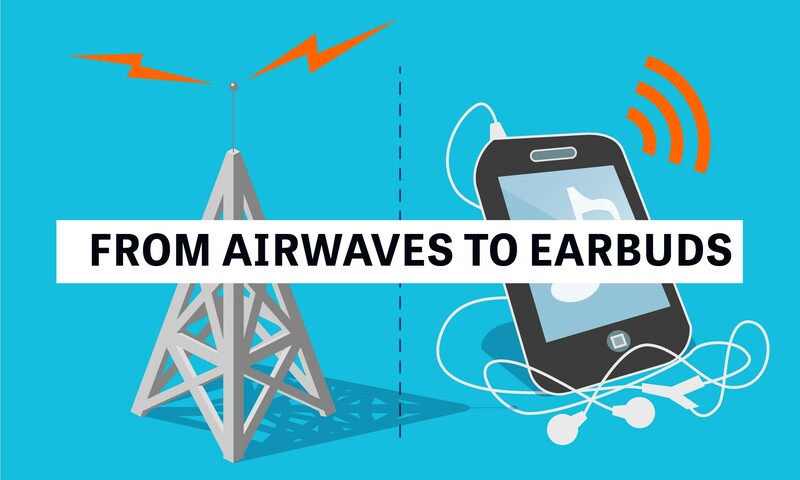 Edison Research reports that, based on a survey conducted in January and February 2016, an estimated 155 million Americans over 12 had listened to some form of online radio in the preceding month, and 57 million had listened to a podcast. The runaway success of the podcast “Serial,” which originated within the public radio show “This American Life,” helped spark interest in the medium, which is reaching new audiences, giving rise to new voices and creating new revenue streams. Seeking to accelerate positive change, Knight Foundation made several recent investments to support the advancement of journalism and public information programming delivered through podcasting and on-demand audio formats. This report summarizes initial findings from the experiences of several recent Knight grantees working in this rapidly emerging field: Project Carbon, which comprises grants to NPR and several local public radio stations to build out the digital infrastructure of public radio; Radiotopia, a new podcasting network developed by Knight partner PRX Inc.; WNYC Discover, a mobile podcasting application; and a Knight Enterprise Fund investment in Gimlet Media, a private podcasting company started by public radio veterans. The approach to this review was to “learn alongside” grantees by reviewing progress of the grants and investments to date, giving grantees the opportunity to provide insights into their work, and to do this in conjunction with an in-depth look at the broader podcasting context. The report does not cover some of Knight’s more recent podcast-related investments, including Pop Up Archive¹ to create open-source software for organizing and publishing archival audio content from small and independent producers; RadioPublic, a for-profit public benefit corporation established in partnership with PRX; and a grant to “This American Life’s” Satchel, a tool to facilitate social sharing of podcast audio snippets. While this report’s primary basis is a particular set of grants, the inquiry into grantee experiences quickly blossomed into larger conversations about podcasting and digital audio writ large, and in particular the ways that journalism and public information producers are more and less equipped to interact successfully with the new digital listening audience. Indeed, the ground is shifting rapidly. New entrants with large wallets and access to talent, rapid evolution in technical infrastructure and capability, explosive increases in audience uptake, sharply rising revenue and quickly broadening public awareness are all driving change in the on-demand audio world. Grantees are forced to take notice and to take action. Not all are ready. Knight Foundation’s grantees and Enterprise Fund investments have shown success in growing new audiences, particularly among younger cohorts that might not turn to radio. Digital entrants Gimlet and Radiotopia are experiencing significant year-over-year audience growth. Listeners across digital media also skew to the low 30s — far younger than the average age of an audience member for the public radio broadcast system. These efforts are also giving rise to new voices. Gimlet and Radiotopia are developing new shows, both NPR One and WNYC’s Discover app are seen as greenfields to experiment with new content in a way freed from the constraints of public radio broadcasting, and RadioPublic is developing discovery methods to increase the appeal of podcast listening for new audiences who aren’t familiar with the format. Several Knight Foundation partners are either reinvigorating old pathways to revenue or illuminating new ones. NPR One is feeding user registration to local stations, helping potential public media members to replenish an aging audience. In addition to ad sales, Radiotopia has raised significant funds through crowdfunding, events and sponsorships. Gimlet’s for-profit model has attracted enough interest to meet investment targets, and ad inventories continue to sell out for major shows. The public radio system, while having made progress, is not yet well positioned for audience-first, digital delivery. Project Carbon, WNYC’s Discover app, and RadioPublic represent significant strides in transitioning the public media system to a digital-first orientation. Podcasting and on-demand audio today is a fertile field into which many seeds are being planted, and with more or less intentionality. 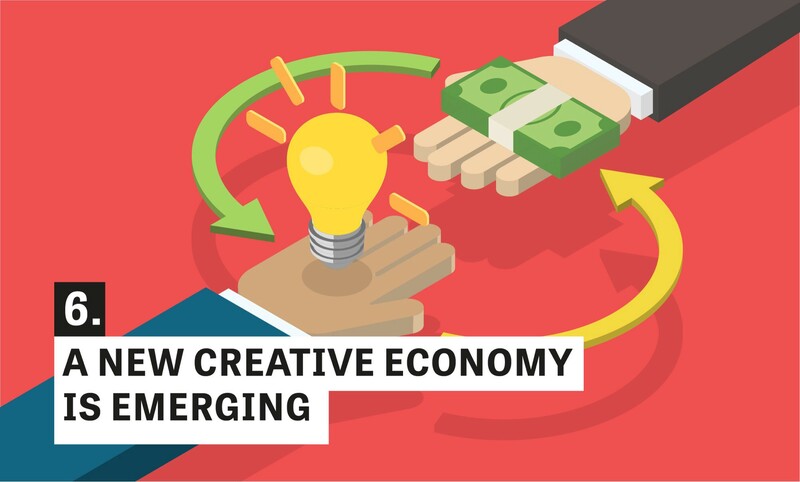 As this report shows, however, these new opportunities face significant headwinds and will demand continued creativity, drive and investment to reach their full potential. Knight Foundation worked with Lutman & Associates and Dot Connector Studio to perform this review. Data were collected in spring and summer 2016 through more than 60 face-to-face and phone interviews with grantees, public radio leaders, producers, industry experts, and other stakeholders (see Appendix A for interviewee list); a review of internal grants memoranda, grantee reports and updates, and staff correspondence; and an extensive literature review of the field, including white papers, industry reports, and books related to journalism, technological innovation and adoption, audio production, public broadcasting policy and more. Knight Foundation has invested in and worked with several major efforts to support journalism and public interest programming delivered via podcasting and to advance the digital transformation of audio content. Knight Foundation made multiple investments totaling $4.4 million in Project Carbon, an initiative led by National Public Radio. The grant for Project Carbon was intended to support the development of a seamless digital listening platform across all NPR affiliates and available through all digital devices. Project Carbon represents an effort to map the public radio system’s transformation from broadcast-first to digital-first, encompassing multiple elements of new and necessary shared digital infrastructure for the public radio system. The bulk of the effort by NPR has been directed to the NPR One app, which provides some elements of this infrastructure, while key member stations pursued other component parts. Several member stations are participating. One collaboration is a joint project by KPCC (Los Angeles), WHYY (Philadelphia) and NYPR (New York City) to develop Loud.ly, a project designed to build new capabilities for audio streaming and delivery, with emphasis on strengthening content management systems, mobile infrastructure and digital revenue interfaces that together facilitate a station’s connection to digital platforms. KQED (San Francisco) is working to migrate its digital audio assets, particularly newsroom assets, to the Dalet content management system, enabling nimble sharing and delivery of locally produced audio content via the NPR One app and other digital platforms. (Dalet is a commercial software vendor whose product is used by some of public radio’s largest producers.) WBUR (Boston) is implementing NPR’s application programming interface and is improving its capacity for sharing user data among departments such as membership, events, underwriting and content. Minnesota Public Radio (MPR) has led an effort called Public Radio Engaged, a collaboration with other public radio stations and NPR’s Carbon Services Identity Platform intended to establish the protocols and tools needed to connect local user data with system-level data related to audience consumption and preferences. Radiotopia is a curated network of podcasts formed to help independent media makers develop audiences and revenue for their work. Formed within PRX Inc., Radiotopia was granted $1 million from Knight Foundation in November 2015. Radiotopia’s lead producers are Roman Mars, originator of the popular podcast ”99% Invisible,” and Julie Shapiro, executive producer. The overarching strategy for Radiotopia is to leverage its podcasts as a network in order to benefit independent producers. 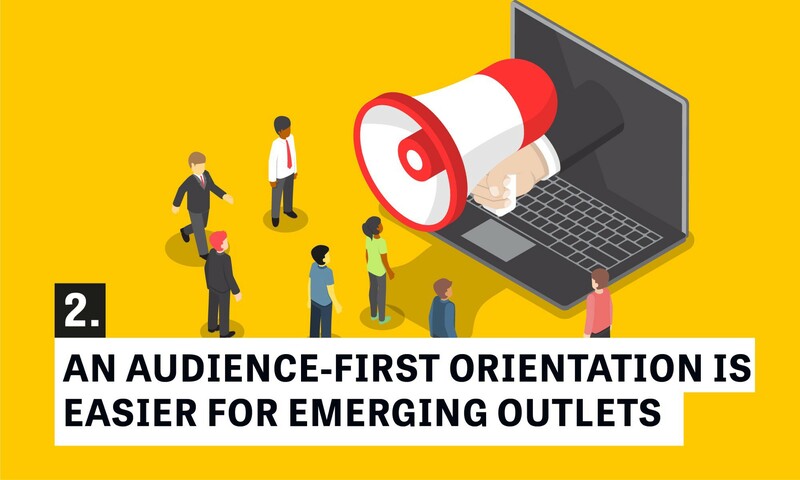 In the sea of podcasters, it is challenging for independents to differentiate themselves and gain the audience and revenue needed to support themselves. Through Radiotopia’s efforts, indie podcasters can receive mentoring on production and on audience expansion and revenue development. They also can participate in networkwide fundraising, promotional and audience engagement activities. In this way, PRX sees Radiotopia functioning similarly to a record label or other talent aggregator that brings visibility and sales to individual producers. Knight Foundation has made two equity investments in Gimlet Media through the Knight Enterprise Fund, the first in 2014, followed by a reinvestment in 2015. These investments have advanced Gimlet’s ability to develop and release additional podcasts for its network. Gimlet is a for-profit, digital-first media company that produces high-quality, narrative podcasts. Its two founders cut their teeth in public radio; Gimlet’s programs fall mainly within the voice, audience target, storytelling style and subject matter that appeal to traditional public radio audience psychographics, with age being the exception. Gimlet is staking its success on the ability to produce finely honed shows that elevate the craft, in the same way that Netflix and Amazon have been reinventing television for on-demand premium cable viewing. “[P]odcasting still has an association with something that two dudes make in their basement. There’s a ‘Wayne’s World’ connotation to it. But I think of them as shows: sleek, produced, where you have people who are good at it doing it,” Gimlet co-founder Alex Blumberg told Shan Wang in a 2015 Nieman Lab interview. Knight granted $250,000 to allow New York Public Radio to further develop and share the Discover app, WNYC’s mobile app for on-demand listening. The app delivers curated, personalized playlists that are optimized for offline, time-shifted listening. It is aimed at New York City commuters who listen on mobile devices. Content accessible via Discover includes all WNYC news and programs, along with selected programs from other producers. Although not reviewed as part of this study, in May 2016, the Knight Enterprise Fund, along with several other investors, including The New York Times and American Public Media, announced an equity investment in RadioPublic, a podcast listening platform launched by PRX. Together PRX and RadioPublic operate as a hybrid enterprise with RadioPublic focused on listeners and PRX primarily serving audio producers. The broader context around podcasting and on-demand audio is heated and dynamic, and looks different to different people. …reminds me of the launch of satellite radio and the fear that gripped public radio broadcasters as they imagined millions of listeners gravitating to satellite’s vast channel structure, built on a subscription model that felt a lot like “sustaining memberships” in price. …is like the Wild West. The space is completely open. 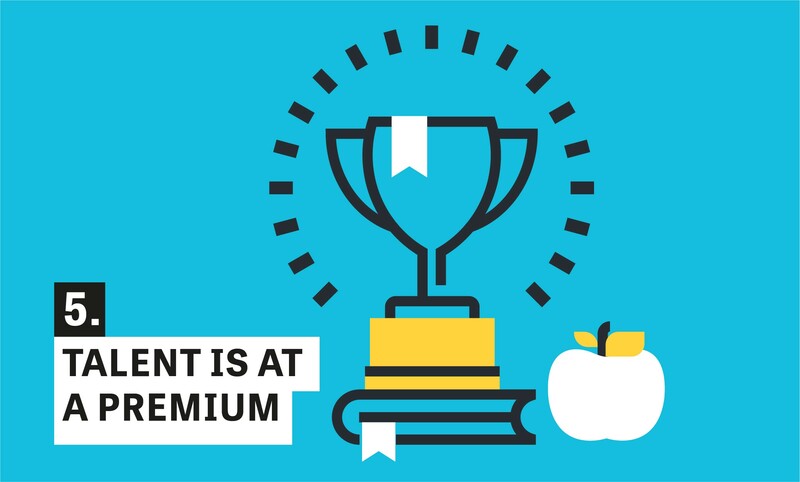 It’s competitive, but you can stake your claim and succeed. …is like blogging in the 1990s. Any person with access to the tools can develop a memorable voice and a large reach. There are hundreds of blogs on every niche subject imaginable. No one had a blog, then everyone had one. The same is happening with podcasts. …is like premium cable. Audiences are willing to subscribe and they listen fervently. When they find a new show they like, they’ll listen to every episode ever created. …is like public radio back in the old days. It’s very uneven but it’s also very quirky and interesting. There are a few gems and a lot of garbage. It’s a place where a generation found its voice. …is like Netflix or Spotify where you subscribe to gain access to a very large catalog larger than any you would assemble for yourself. …is like the moment when newspapers had to be on the web. Suddenly there’s a whole new medium with new competencies and everyone feels they must be in the game. While much ink has been spilled analyzing key developments, discussions with key players in the space — including Knight Foundation grantees and partners — surfaced 10 key themes of particular salience. 1.The podcasting audience is markedly different from the traditional audience for broadcast public radio. While research is inconsistent, audiences leading the listening surge for digital news, narrative and public affairs content still largely fit the profile of early adopters. As Jesse Holcomb, associate director of research at the Pew Research Center, said, “They’re more likely to be male, young, have higher incomes, be college graduates, live in an urban area.” This held across Knight Foundation grantees and partners, for which the most common average age of a podcast audience is in the low 30s. The podcast audience is also growing. Knight grantees and partners report continuous and sometimes explosive audience growth. Edison Research survey data shows a fifth of Americans 12 and older (21 percent) have listened to a podcast in the preceding month — up from 12 percent in 2013 (though Edison also notes that podcasting “accounts for only a small sliver of the share of time Americans spend listening to all audio sources”). This contrasts with the public radio broadcast audience, which Knight partners say today represents “the core of the core.” Listeners on new platforms are likely to be “new to database” and are not already radio listeners. 2.Like many media makers and outlets, public radio broadcasters are working to adapt to an audience-first universe. “Radio shows need to please a lot of people at once,” said one media analyst and podcast host. 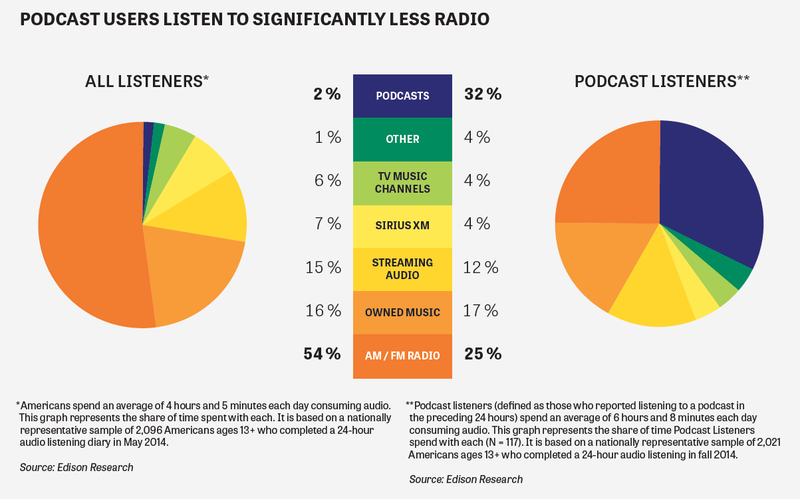 “They are fundamentally for a mass audience.” He contrasted these broadcast realities with podcasting: “Podcasts are things that listeners opt into.” Listeners are in control of when, what and how much they hear, and routes to discovery are different. It is difficult for legacy public radio organizations to serve both their existing audiences, for which paths to revenue also are clear and well established, and the emerging digital audience and less predictable revenue sources. 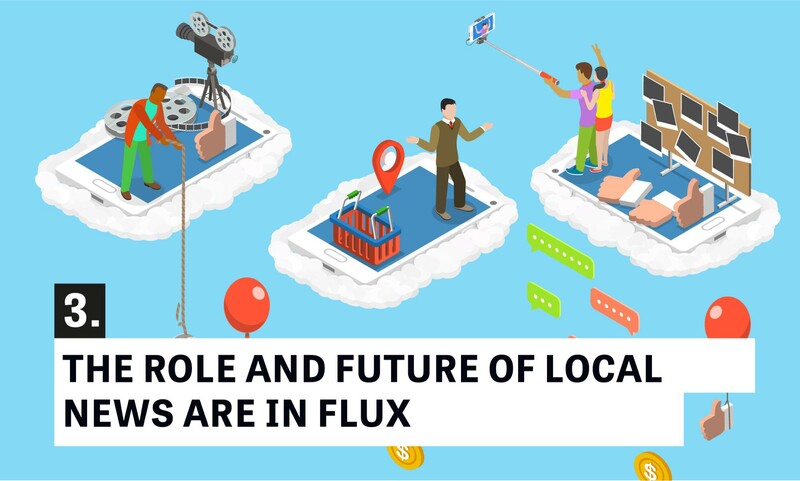 Station-based producers are finding that their broadcast audiences are not particularly fertile ground for drawing audiences to on-demand content. Many stations and all of the major public broadcasting networks are working to identify and reach new listeners through alternate means, most prominently social discovery, but their efforts are hampered by clunky tools and data collection methods. Gathering and interpreting real-time data can be overwhelming, and much of the most valuable audience data is locked in the black boxes of the major commercial companies that serve up podcasts. Capturing audience data is a key driver influencing public media organizations to develop their own apps and platforms, such as NPR One, Discover and the new RadioPublic app, among others launched or in development. “What we want is an audience experience where we can have a relationship with those people,” said an NPR executive. 3.One counterintuitive suggestion from interviewees is that local news coverage may be a strong driver for digital consumption of audio. This is not the case for podcasting, although listenership for local newscasts within NPR One is much higher than predicted. There are bright spots such as “Curious City” podcast at Chicago station WBEZ and adventurous experiments from local stations such as West Virginia Public Radio, Austin’s KUT and Santa Monica’s KCRW that show that listeners will download podcasts by local producers if they take advantage of the strengths of the platform. But for the most part it is difficult for such programs to reach a scale where they can become self-sustaining. WNYC reports that its newsroom is working in hybrid formats, producing limited series for on-demand listening that expand and amplify stories that merit more depth and more expansive coverage. This area of exploration is viewed by many interviewees as ripe for innovation and investment. Another way local news can reach widespread digital audiences is to feature it in the context of a broader national network, akin to the local-national newscasts offered back-to-back on NPR One. An executive from “Reveal” said that about half of the program’s content is reserved for investigative work from independent and local reporters. This underscores the value of partnerships, creates a marketplace for coverage that did not previously exist, exposes listeners to stories from all parts of the country, and offers the potential to create more space for investigative reporting across the dial. The program is carried weekly across 330-plus stations, as well as distributed as a podcast, taking advantage of differing listener habits. 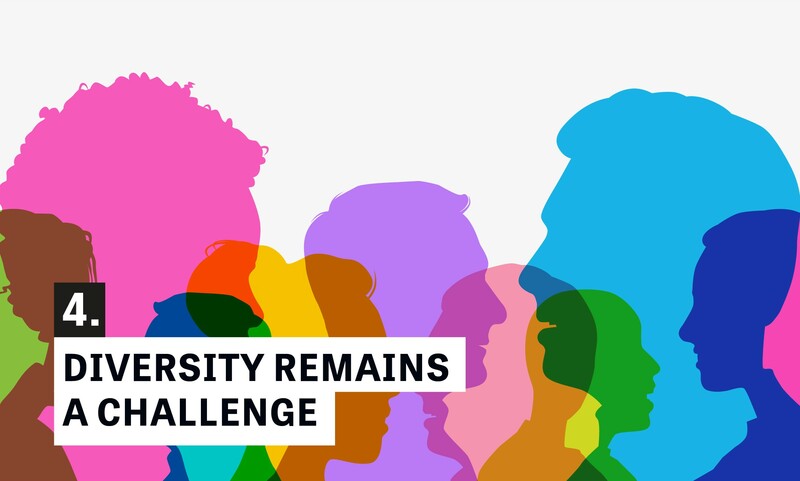 Diversity is also a core value of the “Reveal” team, so the emphasis is not just on airing voices from many communities, but also across a range of experiences and identities. 4.It has not escaped the attention of younger and more diverse audio producers that all of the most popular voices in the public media podcasting ecosystem are white, and most of them are also male — ”monolithically so,” Charley Locke wrote in a 2015 Wired piece titled “Podcasts’ biggest problem isn’t discovery, it’s diversity.” As of mid- 2016, only a few of the top-100 iTunes podcasts that come from public media were programs explicitly created to diversify on-air voices, including NPR’s “Code Switch” (ranked 51st); “Snap Judgment” (73rd), a show that emerged from PRX’s Public Radio Talent Quest and is co-produced with WNYC Studios; and “2 Dope Queens” (28th), also from WNYC Studios. This means that podcasting’s dominance by what’s widely described as “two dudes talking” could also be on the wane — at Werk It!, Walker noted that 22 percent of podcasts are now hosted by women, up from 11 percent in 2013. 5.The brain drain from public radio to podcasting enterprises has been well documented. Interviewees agreed that the “talent wars” are real. Three main cohorts are susceptible to recruitment from the inner sanctums of public radio. The first group comprises experienced hosts and producers who feel constrained by the voice, tone, subject matter and orientation of public radio and have creative ideas they are not able to explore within the constructs of their current job responsibilities. The second cohort consists of younger producers and staff members who were initially attracted to public radio but do not see great potential for moving up the responsibility chain to exert more influence over programming. In the third set are the web developers, software engineers and other technical staff members whose job possibilities are plentiful, whose skills are applicable across many industries, and who have employment expectations that public media is challenged to meet (higher salaries, flexible working hours, remote locations, and consistent raises and promotions). 6.The wide-ranging and often freelance community of audio producers that works in and around public radio has latched onto podcasting as an open space for experimenting and for perfecting new skills, styles and techniques. However, for most, podcasting does not pay the bills. Instead, a pattern is emerging that is similar to art, independent music and other creative fields: Many people are creating work for passion or recognition, and only a few are rising to the level of well-compensated professionals. Listenership is highly concentrated. Half of podcasts are downloaded less than 175 times. Only the top 1 percent of podcasts are downloaded more than 50,000 times per episode — the minimum number that those interviewed for this report cited for a podcast to be attractive to sponsors. One approach has been the formation of podcast networks, such as Knight Foundation partners Radiotopia and Gimlet, which are operating like publishing houses or record labels by aggregating producers with a similar sound or focus, creating fan bases and taste profiles across the selections, and commanding higher rates from advertisers across their portfolio of offerings. Interviewees confirmed that podcasts are not just a “farm team” for broadcast content but that they attract their own listeners. Successful podcasters can pitch themselves and more — they can recommend other up-and-coming podcasters, elevating their visibility. The most successful of the podcast hosts who have emerged from the public broadcasting ecosystem cut their teeth in broadcasting and still enjoy wide on-air distribution. Chief among them are Ira Glass of “This American Life,” which started at WBEZ and incubated the podcasting megahit “Serial,” and Jad Abumrad of Radiolab, who is using his success at WNYC Studios to endorse and support the production of other podcast programs. “Planet Money,” another “This American Life” production originally hosted by Alex Blumberg and Adam Davidson, now of Gimlet, has maintained its standing in the iTunes top podcasts since January 2015. The popularity of these podcasts suggests that broadcast is not only a powerful tool for launching and promoting podcasts, but that perhaps a substantial segment of the podcast listeners are merely time-shifting their consumption of on-air shows rather than seeking out digital-first options. Where will new shows come from that can sustain themselves? A handful of existing organizations serve as training and networking hubs and points of distribution for independent producers who work in and around public radio. PRX’s Radiotopia, Matter.VC, and AIR’s Localore initiative have paved the way for inventive independents to experiment with developing digital-first content and platforms and to learn how to operate in the entrepreneurial mode that is in demand today. However, even these national organizations face challenges in gaining access to resources for productions available to larger networks and stations. They also lack stations’ reach, assets and brand. 7.Knight grantees and other public interest players in and near the public radio space are considering how they could collaborate to build a better technical back end for digital audio. As one digital leader said, “The costs of not collaborating are going up and up.” In recent meetings, digital leaders of top stations began meeting to discuss how they might work together to share projects and identify future efficiencies. According to various interviewees, the dream system might include a public interest app or mobile interface that serves as the point of entry to this content, customizable at the station level, and providing mechanisms for supporting both local and national productions. Areas of need cited by those interviewed include more seamless local-to- national and local-to-local content management systems; negotiated sharing agreements across digital audio platforms; widespread adoption of mechanisms for dynamic sponsorship and advertising as well as donation mechanisms; shared metrics and data capabilities; and targeted resources for production and experimentation, including in local reporting and research and development. NPR One, WNYC’s Discover App, RadioPublic and PRX’s Dovetail ad-serving platform are all attempts to create needed audience-facing digital infrastructure, but solving the governance, funding, collaboration and interoperability problems remains challenging. 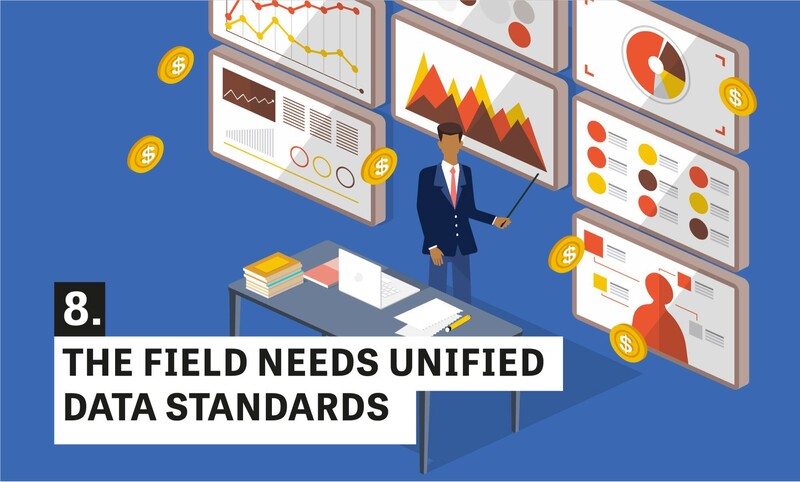 8.Beyond the data challenges faced by the legacy broadcasting system, on-demand audio and podcasting suffer from an industrywide lack of measurement standards to deliver audience insight and enhance revenue development at the macro level. Certain consumption measures are relatively easy to track, but many of these do not deliver substantial insights for producers or their business operations — and not every producer counts these measurements in the same way. Furthermore, the lack of standardized data means that sponsors must rely on other methods to understand their reach. Advertising sales staff interviewed for this report say that instead of discussing the merit of audio programs, they spend a significant portion of every sales call informing potential buyers about the metrics that are or are not available for podcasts. 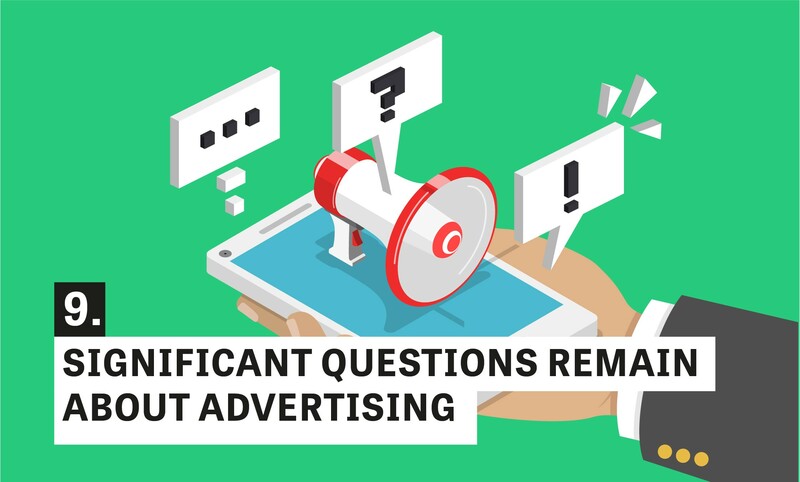 Standardization efforts are underway through leading advertising stakeholders, including the Interactive Advertising Bureau. In addition, a group representing more than a dozen stations and networks have offered a set of guidelines, released in January 2016. And, an industry working group named Syndicated Media, with participants such as PopUp Archive, Acast and PRX, has been working on common efforts to address issues such as RSS. 9.On-air messaging on public radio is regulated by the Federal Communications Commission (FCC) and cannot include calls to action. Messaging is generally delivered in the generic voicing of branding spots that include a business name and tag line. Furthermore, public radio journalists do not voice spots, either live or taped. Public radio spots are short and to the point. Freed from FCC requirements and with a different audience, podcasting is discovering different forms of revenue generation. Podcast producers, especially independents and small shops, have utilized crowdfunding sites such as Kickstarter or Patreon. For example, PRX had a very successful Kickstarter campaign when Radiotopia launched, exceeding its $250,000 goal and raising more than $600,000. Gimlet Media raised its final $500,000 in investment capital in a similarly successful crowdfunding effort. Many small producers encourage listeners to contribute via Patreon. Podcasting has also found that new sources of advertising revenue CPMs in podcasting are much higher today than broadcast CPMs in public radio. (CPM is the abbreviation for the cost advertisers pay for each 1,000 people reached.) Many interviewed cited $18 to $25 as a CPM range for podcasting, with some much higher. In a presentation at the 2016 South by Southwest festival, Ira Glass of “This American Life” stated that CPMs for the wildly popular “Serial” podcast were in the $50 to $60 range. The ability to create interesting messages that break from public radio’s regulatory standards and long-standing production values is a key attribute of podcasts that observers say sponsors like. Increasingly common are host-read, rambling advertising spots that are custom-made and often created in a storytelling mode. Sponsors also are attracted to the “fierce loyalty” of podcast listeners and to the fact that they tend to be young, well-educated, and highly paid. As podcasting grows in reach, sales firms expect a shift in sponsorship to include brand advertising, not just calls-to-action and consumer product spots. 10.For some public radio veterans, the Sturm und Drang around podcasting is unpleasantly reminiscent of previous waves of excitement around other distribution platforms, from satellite radio, to station websites, to apps, and beyond. 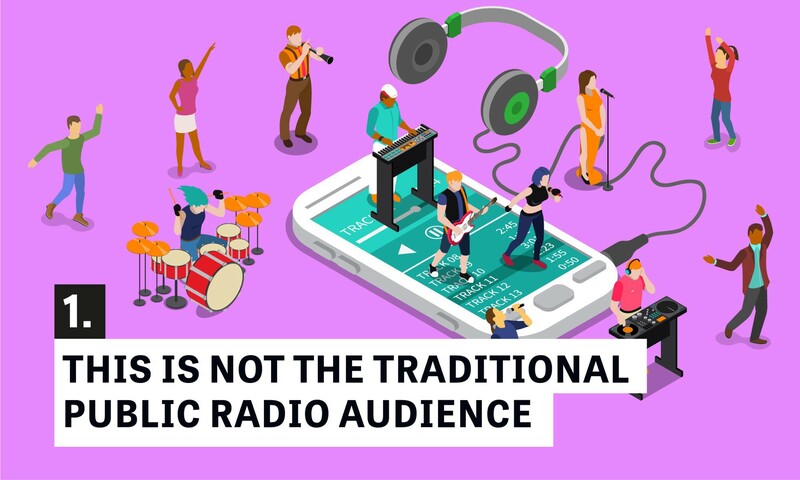 They suggest that broadcast radio has successfully weathered prior disruptions and will continue to serve as the industry’s cornerstone for listening and revenue for decades to come. Knight Foundation has invested in and partnered with diverse players in the podcasting and on-demand audio marketplace. The foundation’s efforts address different approaches to providing quality content to listeners who are increasingly seeking digital audio in a mobile-centric environment. While these efforts are distinct and unique in their aims, scope and structure, they have yielded important insights and lessons. Knight Foundation’s grantees and Enterprise Fund investments have shown success in growing new audiences and creating the space for new voices in audio. Gimlet and Radiotopia in particular have exceeded audience projections. Gimlet is reaching millions per month, many in a younger demographic than the traditional public radio audience. Radiotopia has tripled the number of monthly downloads in the past year. The NPR One app, a part of Project Carbon, tends to reach listeners whose age skews to the low 30s — far younger than the average age of an audience member for NPR’s flagship properties. 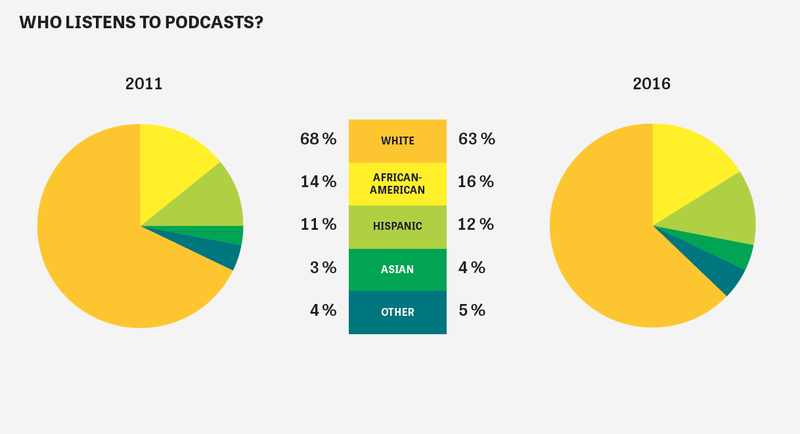 Surveys also show that app listeners are somewhat more racially diverse than public radio listeners. The extent to which this audience can continue to grow is up for debate. All told, NPR’s digital footprint — including through Apple’s iTunes — comprises tens of millions of downloads per month. Matt Lieber, Gimlet’s co-founder and president, believes that the addressable market for podcasts is far from saturated. Mobile phones are ubiquitous, and discovery is getting easier. Millions more people have heard of podcasting (as a concept) than currently listen, so even closing that gap without increasing awareness would bring a large new audience to podcasting. Audience growth is also being achieved in new ways as efforts native to podcasting tap the power of their growing networks. Matt Lieber noted that people find out about podcasts first and foremost from other podcasts, and that Gimlet has experimented with ways to promote its new shows within the current ones. Other successful promotional efforts include deliberately generating buzz via word of mouth, including social media mentions, and through savvy press and media coverage. Similarly, by aggregating podcasts into a network, Radiotopia is able to create a narrative around the group of podcasts and deploy the narrative for more successful marketing, sales and distribution than shows could achieve on their own. These efforts are also giving rise to new voices. Gimlet is debuting several shows. Radiotopia has grown from 11 programs to 14 and created a contest called Podquest to find new talent. Launched in March 2016, Podquest received 1,537 entries from 53 countries. The contest created excitement in the podcast field and was widely covered by media. Radiotopia’s focus on new voices, especially women and people of color, shows the depth of talent and size of audience for this work. By aggregating podcasts from otherwise less-known producers, Radiotopia is demonstrating that a large number of high-quality producers exist who do not have regular access to other outlets, including public radio, and whose addressable audience is sizable. This dynamic is especially true among legacy players that feel an urgency around bringing fresh blood to the field. NPR One provides producers with an open field, freed from the tight clocks and standard sound of public radio, and it allows vastly expanded opportunities to include new voices and new forms. NPR One has already proven to be a useful tool for piloting new content with real-time audience data that can inform program development. Examples include Kelly McEvers’ in-depth reporting for the “Embedded” podcast, the “NPR Politics” podcast tracking the 2016 election campaigns, and podcasts created by the Code Switch team exploring race and identity. At NYPR, particularly with the launch of podcasting and program development unit WNYC Studios, the Discover app provides an off-air platform for new program development. Several Knight Foundation grantees are either reinvigorating old pathways to revenue or illuminating new ones. The results across approaches to podcast revenue vary. Gimlet, as a for-profit company, has led multiple successful fundraising rounds. RadioPublic has also managed a successful seed round. Gimlet and Radiotopia have received significant interest from advertisers. Gimlet’s model has attracted enough interest to meet investment targets, and ad inventories continue to sell out for major shows. Lieber reports that sponsors are attracted to Gimlet’s fiercely loyal, engaged audience, and sponsor renewals are correspondingly high. Even within the traditional member-based support model for public media, podcasting is surfacing new opportunities. NPR One is feeding user registration to local stations, returning 50 to 80 percent “new to database” names— essentially new potential public media members to replenish a rapidly aging audience. In addition to ad sales, podcasting efforts have illustrated new revenue opportunities. Radiotopia has raised more than $600,000 through crowdfunding. Radiotopia has also worked to develop sponsorships, event revenue and other ways to put dollars into the pockets of independent podcast producers. In a sense, all of these efforts represent the ongoing transition of public media to a digital-first orientation. The public media ecosystem has continually pushed to evolve the ways it can meet its mission. But the migration of digital audio consumption to mobile means a new round of digital investment and digital strategizing is needed. The surge of investment in digital media is providing a source of funding that has proved attractive for public radio veterans looking for the opportunity to take entirely new approaches. Both Gimlet Media and RadioPublic are startups that have emerged from public radio. Gimlet is focused on finding and funding high-quality, informative content. RadioPublic, formed as a public benefit corporation, has instituted core elements of the public media mission into its corporate charter. Project Carbon, in particular, was oriented around the need to transition the broadcast public radio system to the digital preferences of today’s audiences. Toward that end, progress has been achieved. A key step has been the successful launch of the NPR One app. The app has been very well reviewed; its functionality is being updated continuously with new features such as a recommendation engine, donation capability, sharing capability and many new content features. Project Carbon has also accelerated the ability for various parts of the public radio system to reach audiences digitally. NPR Station Connect has led to more than 100 member stations across the country producing local newscasts for NPR One to serve their local on-demand audio audience. The NPR Developer Center, a part of Project Carbon, has made it possible for NPR One to be available across 30 vehicle makers and via iTunes, Google Play, Windows Phone and Google’s Chromecast. These strides not only improve the audio experience for digital and mobile listeners, but they also assist the public media system in adopting the methods of the digital media age. NPR’s accomplished analytics staff has created new tools to derive insight from audience data compiled from NPR One users. The data are far richer and more nuanced than the analytics producers can obtain from other third-party platforms. Similarly, through the Discover app and the development of digital audio content, NYPR leaders believe they have arrived at key insights about both advertisers and audiences. Despite this important progress, much work remains to be done. Public radio has yet to fully scope, design and cost a scalable, shared digital infrastructure that can serve the system’s major market stations and its leading producers (including NPR). 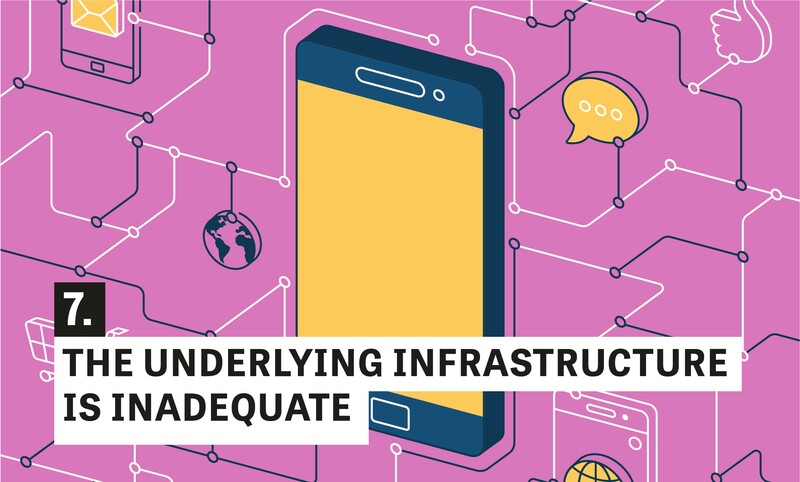 Many of those interviewed acknowledge that the challenge of building an adequate digital infrastructure is, quite simply, both a more major undertaking and a more daunting challenge than they anticipated. 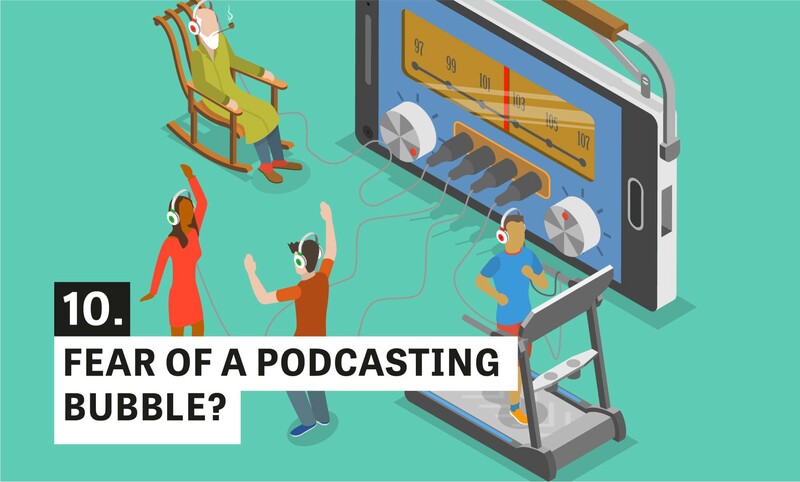 Podcasting and on-demand audio is a rapidly evolving medium, ripe for experimentation and innovation and well suited to creative and far-reaching public interest applications. Many of podcasting’s most successful programming is crafted by public radio producers or by people who have recently left public radio for podcasting startups. Yet the public radio system, one of the nation’s most utilized and trusted sources of news and information, is not yet well positioned to take advantage of deep shifts underway as the rising, younger audience moves from broadcast to mobile and digital audio platforms. Competitors loom large. Knight Foundation investments have made some significant strides in this context, but they have also encountered headwinds. While digital upstarts in which Knight has invested are growing audiences and lighting a path to new forms of sustainability, they remain in early stages, with real questions about their full growth potential. Efforts to transform the larger public media system, especially through Project Carbon, have yielded progress and also illuminated larger challenges in moving the NPR structure toward an adequate digital backbone. All of this is happening in a dynamic context, whose future may be hard to predict. The demand for quality news and audio content remains firmly fixed across generations. The best model for meeting these demands and the point of sustainability is an open question. Knight and other grantmakers across the U.S. can benefit from conversations with local and national media makers to identify opportunities for new impact as audiences’ listening patterns shift to on-demand. Today’s dynamic environment makes timing especially good to bring new voices and new audiences to public interest programming and to help lower barriers to entry so that journalism and public information programming can flourish as this key delivery platform expands. Read the full report and Appendices here. SARAH LUTMAN is principal at Lutman & Associates, a consulting and program development enterprise. Learn more at lutmanassociates.com or follow her on Twitter @Lutman_Sarah. JESSICA CLARK is founder and director of Dot Connector Studio, a media production and strategy firm. Learn more at dotconnectorstudio.com or follow her on Twitter at @beyondbroadcast. ANGELICA DAS is a senior associate at Dot Connector Studio.